Gas canisters are devices of Forerunner build. They were most noticeably seen at the gas mining facility over Threshold and were presumably used by the Forerunner for the containment and distribution of gas. The container component of a gas canister is transparent, making it easy to observe whether a canister is empty or filled with gas. When a filled canister experiences a breach, the gas violently escapes from it, producing a potent explosion as it disperses in the air. Gas canisters could be transported through a variety of means, including the gas mine's system of conveyor belts. They were also occasionally carried by Sentinels. 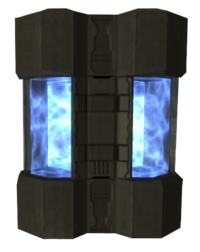 Gas canisters are only found in Halo 2, in the two campaign levels set inside the gas mine; The Arbiter and The Oracle. In addition, empty ones can be found in the multiplayer map, Colossus. In-game, they come in two variations: empty and filled. The empty variant is a clear box and proves to be exemplary cover, albeit the fact that the bulk of them move on conveyor belts. The latter is filled with swirling blue gas from the gas giant Threshold, and is highly explosive if fired upon. Gas canisters produce a powerful, albeit short-lived, explosion. An empty gas canister near the entrance to the gas mine's hangar bay. A filled gas canister in the gas mine's hangar bay. A Sentinel carrying a gas canister. For a complete list, check out our Forerunner directory.